In my next life I’m going to knit. My grandmother taught me the basics when I was younger but I confess I never had the patience to persevere with a knitting project beyond the obligatory scarf (and even then, mine was more of a cravat). But it is a skill that I really admire and there is something about a hand knitted garment that is extra special. 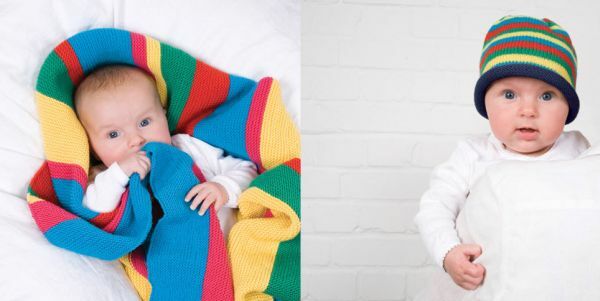 If you are clever enough to be able to knit and you are on the hunt for patterns for children that are super stylish, look no further than MillaMia. MillaMia have two collections – Bright Young Things celebrates colour and is inspired by clashing patterns and playful, quirky designs. In contrast is the subtly stylish Close Knit Gang which features timeless vintage style (think cable knits and cosy cardigans). Each collection features patterns suitable for beginners through to more experienced knitters as well as projects that can be whipped up and some that you might need to begin in summer! I just love the bolero length cardigans for girls, the striped rug for babies and the superb knitted dresses. There’s a cardigan in the Close Knit Gang collection that I would love to own (for me, not my kids!) – it’s classic, it’s cream, it has just the right amount of cable knit detail. MillaMia have a neat little section on their site titled Making Knitting Easy which includes lots of useful online links covering the how-to’s and trouble shooting. I’m not going to get ahead of myself… I’ll just wait until my next life! MillaMia pattern books are £14.95 each and their 100 per cent extra fine Italian Merino yarns are £4.50 each. Knitting gift sets begin at £22.50 and would make an ideal present for a new nana who is itching to get those knitting needles out! MillaMia ship from the UK to Australia.